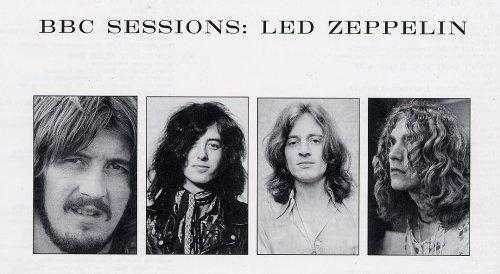 Led Zeppelin - "BBC Sessions"
For me personally this is a very important recording. I'm 43 years old and never saw Led Zeppelin live, and indeed came to their music just as the band split up after the death of John Bonham (drums). Over the last twenty years my love of their music has increased, and now if forced to choose I'd put them at the top of my list of music I couldn't live without. Having never seen them in concert I've not been in a position to see if their reputation as the greatest live band of the 70's was justified. The live album, "The Song Remains the Same" is a film soundtrack taken at the end of a gruelling concert tour, Plant's voice is in rags, and for me just doesn't do the band any favours. Ironically the greatest live performers of the 80's - Queen, were similarly badly served by their only live album "Killers" though their position has improved in later years. There are hints in "Led Zeppelin 1", a stunning debut album reputedly recorded in only 30 hours, which has a live, spontaneous feel, but until now the only real evidence I have seen of their greatness is a black and white video of them playing a few tracks of a live set in Scandinavia in front of a silent and bemused audience, this tantalising snippet made me hyperventilate when I heard that at last after 30 years, the legendary BBC sessions were going to be released. Being a Led Zep nut I bought the album on CD and Vinyl (you'll be lucky to find this now). They don't disappoint. The icing on the cake is that they consist of two 70 minute CD's for twenty quid/30e, a bargain - the LP being twice that - but is 4 LP‘s. The first disc opens with a studio set from their first BBC appearance in March '69, the cutting guitar of Page dragging you into the classic Willie Dixon number "You Shook Me Cool". How people hearing this for the first time 30 years ago must have reacted I don't know, but the song, so familiar from their first album, still makes the hairs stand up on my neck. There are three tracks from this session, all the heaviest blues possible, with "Dazed and Confused" eclipsing the album version, and possibly becoming my number one track of all time. The second set is from the 16th May '69, and includes "Communication Breakdown". If Led Zep are responsible for heavy metal and all it entails - the thousand careers and perhaps a billion albums that have been sold, then "Communication Breakdown" is the one track that surely started it all. There are another few tracks from the 24th May '69 including another version of "Communication Breakdown" which shows how the band could improvise to produce a totally different sound from the session recorded just over a week before. Each of these sessions providing awesome heavy blues covers of traditional standards and showcase their talents as songwriters and musicians capable of majestic pyrotechnics at one moment and the subtlest touches seconds later. The love affair between Plant's voice and Page's guitar often being consummated with one flawlessly echoing the other, not something to be attempted lightly. And through it all dear old "Auntie" Beeb lived up to her reputation as one of the best places to put music onto tape. Then at the end of CD disc one come four tracks taken from a live performance at the Playhouse Theatre on the 27th June '69. The mix is a little thin, but otherwise it is a moment to savour - real early Led Zep letting rip in front of a live audience. I think I can detect a nervousness, or perhaps a little self consciousness about Plants voice but that is understandable, this was a radio broadcast that broke the mould. For the second disc (again CD) we move on to April the 1st 1971. The band had conquered the world, had three huge selling albums under their belts and vast experience of live performance. So here is a full concert. One hour ten minutes of Led Zeppelin pulling out all the stops for a live performance in the Paris Theatre, and god be praised, it is unedited. Now I know the truth - they were the greatest live act of the '70's. It's a crazy rollercoaster ride of all that made the first three albums unmissable, and as the cherry on the cake, the first ever performance of the most requested album track of all time - "Stairway to Heaven", released on Led Zep 4 four months later. It's already perfectly formed, the disc that above all others, gave them immortality. The only downside to all this joy is that the CD transfer is considerably better than the LP. Though in a nice boxed set, and with a decent booklet, the LP has the classic fault of modern vinyl ‘reissues’ - it’s obviously been cut by someone who doesn’t know what they’re doing. I suspect a straight transfer of a CD to vinyl with little care over levels. I recently talked with a guy who worked for Phillips for 45 years and cut his teeth (sic) cutting 78's! He described the art of varying cutting level in real-time using the score and a pair of headphones - a lost art. The result is that the sound is initially inpressive, but quickly becomes edgy and is prone to mistracking on inner tracks. Given the bargain status of the CD I’d go for that, after all though the sound quality is good it’s not the reason for buying it. But as for the music space precludes me eulogising more, this is a collection of all that made early Led Zeppelin great. If you're a Led Zep fan then buy it. If you've no Led Zeppelin in your collection, this is the one to start with.